Bumper guard abusers??? Is it worth it? Technique? I wasn't certain where to ask this but I figured it was more technique than equipment. I've never been a racquet paint or bumper abuser. That's not to say I'm accusing others of purposefully beating their racquets. I've obviously scraped them going low for shots. How does one constantly scrape a side of their racquet to the point it has perfectly symmetrical scrapes through the bumper into the frame? If this is you, could you explain? Is it a good shot and what type of shot is it? I've been playing a very long time at a fairly high level and I've only ever had to replace one bumper guard but that was a manufacturer's error more than mine. A chunk just broke off on a routine scrape shot. Mine take a lot more abuse on the stringer than they do on the court. Are you talking about squishing grommets at knots or something else? How so; I guess I'm asking? I string and I could only see someone damaging the grommets when using a starting knot unless the stringer just has horrible abilities/technique. 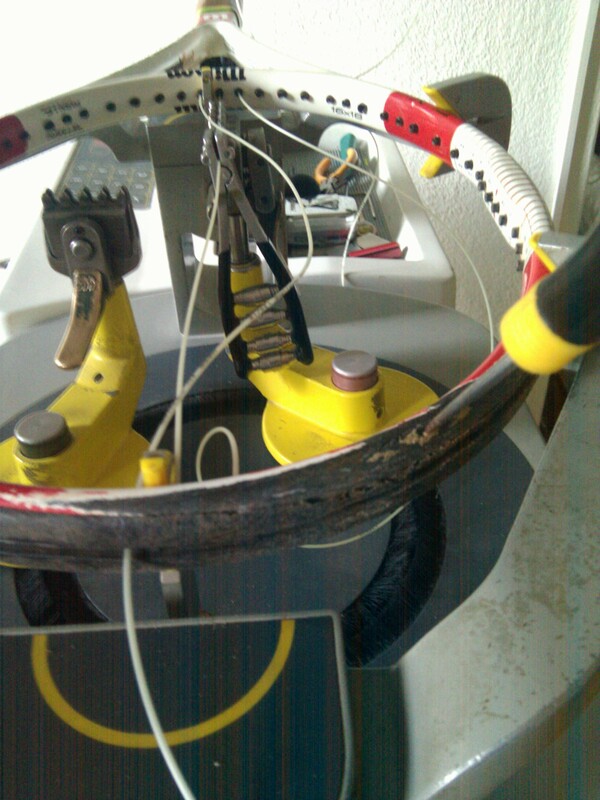 All of my racquets look like that: massive scraping at around 11:00. Comes from BH volleys dug out of the ground [doesn't happen nearly as much on the FH side]. I don't hit a driving slice. When I was younger, my slice was better but I definitely do not drive down like that. 1) Can we save it? 2) Can you find me a replacement like this one? 1) I'll try to string it but if it breaks it's not my fault. 2) Any replacement will not feel the same because of the massive amount of frame that you've removed in your years of customization. I scrape the hell out of my bumper guards with no remorse. All from low backhand slices and volleys. Only costs about $8 for replacement once per year. No big deal. Only if the bumper guards are still available for a reasonable price. Substitutes can be made with some Head frames. However, once they are gone, they are gone and you have to pay thru the nose for a replacement. Wilsons and Princes seem to have a problem with even finding older sets in recent years. Low volleys and digging out low balls the backhand slice.